– 1931, Two Lectures on Architecture by Frank Lloyd Wright, To the Young Man in Architecture, The Art institute of Chicago. it wasn’t the first, and won’t be the last. I want to explain why that may not be so funny. During my first stint as a teacher in the 1980s, I developed a few theories, one of which was the possible consequences of an inadequate educational system. It seemed to me at the time that if we failed to teach important problem solving and critical thinking skills, the student would still go on to graduate, find a job, maybe even get married and have kids, all the while having no appreciation for the skills s/he missed, and therefore unable to pass that appreciation on to their heirs. Equally important, these voters would inevitably make bad choices on election day which, as their numbers continued to grow, would eventually result in the election of a political candidate completely unfit for their position. Maybe someday we will discuss what one should be looking for when choosing a politician. Should these politicians ever reach critical massD, they could then pass laws or make other decisions (like funding) adversely affecting the educational system. This would complete what engineers call a feedback loop, where the outcome of a process affects the input, in this case accelerating the negative changes. “The Proof Is In The Pudding”? Who would have thought I was such a prophet? I recently stumbled upon an article about “The 10 Dumbest States in America”. but if you Google “smartest states” you will see a number of similar articles based on different criteria. Although the results will change slightly, the trends will remain about the same. Being naturally curious, I compared this list to a list of red and blue states I found on Wikipedia. As you can see below, the results speak for themselves. “Republican Governors have led the effort to reform our country’s underperforming education system”. Based on the map, I would have to disagree. The top ten and the bottom ten on a list of smartest states on a map of red states and blue states. To be fair, one comparison of lists of states does not prove anything. There is more than one way to define “smart”, but I think all the conventional definitions will give similar results. 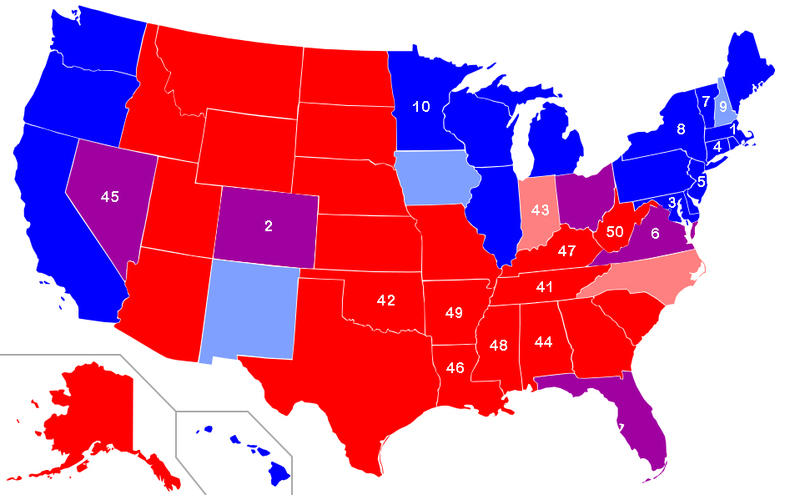 Even in defining “Red States…”, Wikipedia had three different maps, but although the second one gave a better indication of the degree of redness, unless you are planning to study this in much greater detail I’m not sure that really matters. I made this map for illustration purposes only. But Do We Have ‘Cause & Effect’? One very important question about my theory (like any other theory) would be that of cause and effect. When talking about downward spirals, the related question of “which came first” is no longer meaningful. But to have a feedback loop, the cause and effect issue must work both ways. First, would education suffer in a Republican-controlled state? Their stated goals of a much smaller government, their rejection of science, and even a blatant disregard of factsA suggest so. The above map suggests so. If you have any evidence to the contrary, now would be a good time to present it. Do The Uneducated Vote Republican? Second, does stupidity lead one to vote Republican? If true, it would give the Republicans sinister ulterior motives for their cost cutting policies in the departments of education. It also gives them a huge conflict of interest. Unfortunately, unlike judges, politicians don’t have to recuse themselves in those instances. And since the rich are predominantly RepublicanA, it could also help explain their interest in school vouchers and such (if they were deliberately underfunding education in an effort to dumb down America and maintain control, they would want an escape hatch for their own kids and they would have the chutzpah to expect the government to reimburse them for it). This question is, nonetheless, a hard one. Even rocket scientists prefer simple solutions. The principle, now known as “Occam’s razor” after William of Ockham, a fourteenth century English Franciscan friar and philosopher, actually goes back before the Greek philosopher and teacher, Aristotle, who said “The more limited, if adequate, is always preferable”. Although that suffers in translation, it means that if there are two or more solutions to the same problem, choose the simplest. When faced with a tough question like “Which candidate would do a better job of finding real solutions to important problems and working to get those solutions implemented”, someone without the necessary critical thinking skills may not be able to resist an appealingly simple, but flawed solution. Conversely, the same person might reject a more complicated solution s/he doesn’t understand, even if the conditions warrant such complexity. You could say I’m just guessing, however, since I have no studies supporting this notion. Any evidence either for or against this theory would be appreciated. At the very least, it seems likely to me that a poor education would make identifying the correct candidate more difficult, making the decision more random, which would increase the chances of an error, but could benefit either party. It could foreseeably cut the margin of victory of what should be a clear winner (in those cases where such a thing exists) to the point where other nefarious forces could use financial influence to carry the day in situations that would ordinarily be cost prohibitive. I should point out that even if stupidity does lead one to vote Republican, that doesn’t mean the converse of that statement, that all Republican voters are stupid, is also true. If you are a “smart” Republican you already knew that, but are probably relying on the gullible to advance your agenda (an agenda for which they receive no benefit). Unfortunately, I don’t know how to get us out of an educational death spiral. Even worse than alcohol’s ability to impair one’s judgement to the extent that one is more and more unlikely to know when it is time to quit, an uneducated person begins life already impaired; it is the “village”‘sA responsibility to lead (or drag) each of us toward competence (sort of like the first time you pushed your son or daughter’s bicycle until they had enough velocity to maintain balance (and maybe the second time, and the third…). Obviously, we are not doing our job. Maybe it is a motivation issue. Are the thrills and advantages of being able to handle life’s problems not clear enough? As a teacher, I’ve actually had some cases of the parents not wanting to make an investment in the future of one of their heirs with real potential. One of these parents was an itinerant farm worker. Their “reasoning” was (and I’m paraphrasing here) that if ignorance was good enough for the parents, it should be good enough for their kids. Do we need to hire a slick ad agency to convince everybody that life would not seem so hopeless (and we wouldn’t have to rely so heavily on conspiracy theories) if we actually had the ability to get out of harm’s way? One might argue that coddling our children by downplaying their inadequacies and downplaying the advantages of competence so as not to hurt their feelings, socially promoting them to the next level regardless of effort, etc, may have the serious unintended consequence of reducing their motivation. While I’m inclined to let experts debate these issues, I am convinced that as you shrink one’s universe by throwing out more and more of the inconvenient truths, and as one’s grip on reality becomes less and less firm as a result of that policy, the consequences ultimately become more and more dire. Maybe you need to grow up so that your kids can grow up. And then insist that your community invests more heavily in education (and by “education”, we need the broadest, not the narrowest definition). I’m reminded about that old bumper sticker that said “If you think education is expensive, try ignorance”; I don’t have such a bumper sticker because too many people are already eagerly accepting that offer. Education, however, is not an investment opportunity that we can afford to miss. If you know the solution to this problem, let me know. Or better yet, send me a copy of the correspondence to your congressperson explaining the path we need to take. And thank you for listening.